Over the weekend, I had the occasion to tour Comstock House, the historic 106 year old home of Jeff and Candice Elliott. We were a small group of artists, who were offered not only a tour but also time to sketch and paint. The house was designed by locally well known architect, Brainerd Jones, and the property is currently being restored and scheduled for completion in 2012. As I drove past the address on a hunt for parking, it was difficult to see the house as it is mostly obscured by trees. But when I walked onto the property, I saw the Craftsman style house with its unusually asymmetrical roof and facade covered in shingles. Full-blooming dogwood trees and shrubs were scattered about and colorful flowers surrounded the porch area, guarded by two small stone lions stoically protecting the entryway. When I entered the old house I felt time slip back a century. Redwood beams and paneling fill the house. Leaded glass decorates the windows along the staircase. Art deco chandeliers with gas candlesticks, and grape-shaped glass housing electric bulbs adorn the stairs landing. I was completely taken by the warm wooden consoles of vintage radios and TVâ€™s scattered throughout the house. At 10 am, Jeff and Candice greeted us in the foyer and began telling stories. The open floor plan let us all gather around our two hosts to listen. The original owner James Wyatt Oats was a murderer who fled the east coast from his crime, settling in Santa Rosa. He was later acquitted as his older brother William bribed the prosecutor who just happened to be the victimâ€™s father. William was also a commander in the confederate army at Gettysburg. He most famously led the 15th Alabama regiment that lost the Battle of Little Round Top. Nellie Comstock purchased the house in 1916 for $10,000 and members of her family lived there over the next 74 years. In a complete reversal from the houseâ€™s previous owners, Nellieâ€™s father was the head of the anti-slavery group that funded famed abolitionist John Brown. 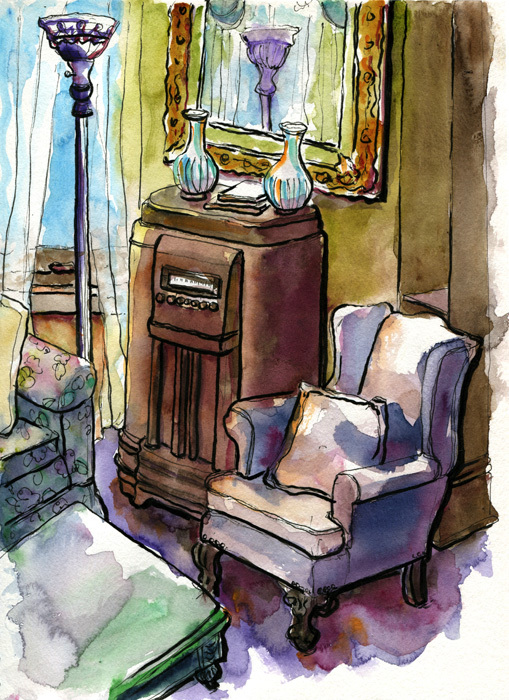 After the tour, I stood beside the piano and drew a cozy corner of the room with its vintage console radio. I just love the streamlined art deco design. While I was drawing, Jeff told me the history of the mirror hanging above the radio, which turned out to be a picture frame engraved with the artistâ€™s name and painting title. The frame, Jeff said, is from a missing painting by the British artist J. B. Payne titled “In the Village of Cheddar”, which no one has ever heard of nor seen the original. Now there’s an important mystery to be solved! 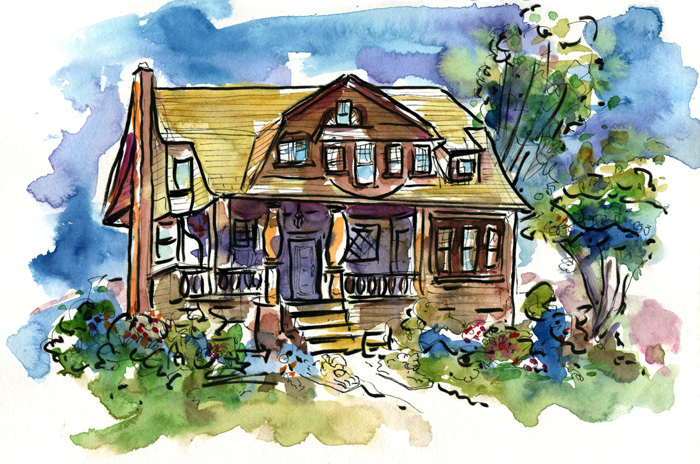 A warm thanks goes to Jeff and Candice Elliott for the tour and allowing us to sketch and paint their delightful, historic home. June 12, 2011 March 29, 2013 Richard SheppardComments are off for this post. These are delightful. They are so lively. I really like the brush pen work. And how you suggest the light falling on the chair and the sheer drapes wafting in the breeze. Thanks Wakar, it was a great place to sketch. I hope we can find more interesting places to sketch this summer! These are just the sort of thing I would do if I were an artist. Would love to be able to do one of my own (unfortunately not historic) house. On the interior view, I love how you did the mirror and the window. I want to grab a book and a cup of tea and curl up in that chair. Thanks Jean! Well, what are you waiting for? Get out those paints and sketch a little. It’s not about accuracy. Heaven knows my sketches aren’t close to being accurate. And yes, it sure does look like a great place to hang out with a good book!